Marriott says its guest reservation system has potentially exposed the personal information of up to 500 million of its guests. The international hotel chain reported the breach today, confirming that its Starwood reservation system had been hacked. The data at risk goes back to at least 2014. The hotel chain’s internal investigation found that an attacker had managed to access its Starwood network since 2014. In September, the company discovered that an unauthorized party had recently copied and encrypted information, and then tried to remove the data. It was on November 19 when Marriott finally decrypted the data to discover that the contents were from the Starwood guest reservation database. Marriott, the world’s largest hotel chain, bought Starwood Hotels and Resorts Worldwide two years back for $12.2 billion. The merger brought major names Sheraton under Marriott’s umbrella. “We fell short of what our guests deserve and what we expect of ourselves,” Marriott’s CEO Arne Sorenson said in a statement. “We are doing everything we can to support our guests, and using lessons learned to be better moving forward.” The hotel chain’s stock has appeared to take a hit, falling nearly 6% in premarket trading. Marriott has established a dedicated website (external link) to answer questions about this incident. The company added that it will start notifying customers whose records were in the database “on a rolling basis” starting today. 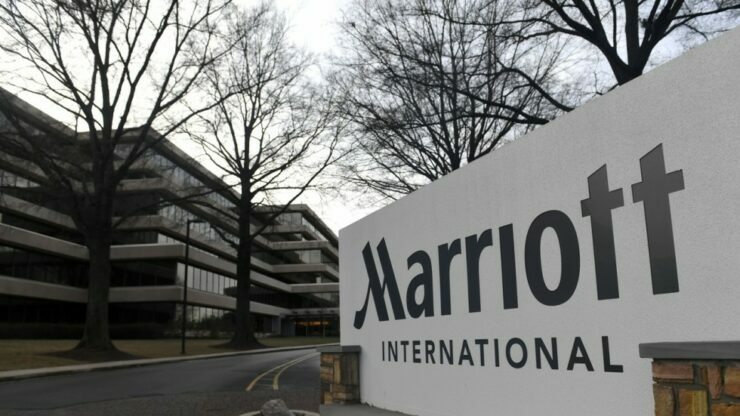 Responding to our query, Tracey Schroeder, VP, Global Consumer Public Relations at Marriott, clarified that the breach does not affect Marriott-branded hotels.